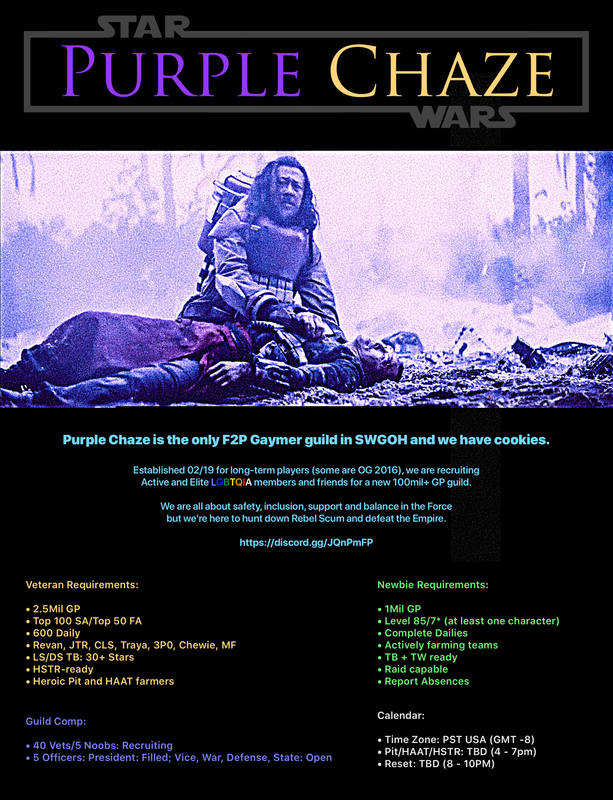 Purple Chaze is the only F2P Gaymer guild in SWGOH and we have cookies. Established 02/19 for long-term players (some are OG 2016), we are recruiting Active and Elite LGBTQIA members and friends for a new 100mil+ GP guild. We are all about safety, inclusion, support and balance in the Force but we're here to hunt down Rebel Scum and defeat the Empire. We are an ultra-friendly and relaxed 127m GP UK-time zone guild with 42 members (3m+ GP average). We have all three Heroic raids on farm and do well in TBs and TWs. We are looking for up to 8 friendly new members that have 2.5m + GP plus RJT or Revan or 7* C3PO (i.e. can contribute materially to hSTR). 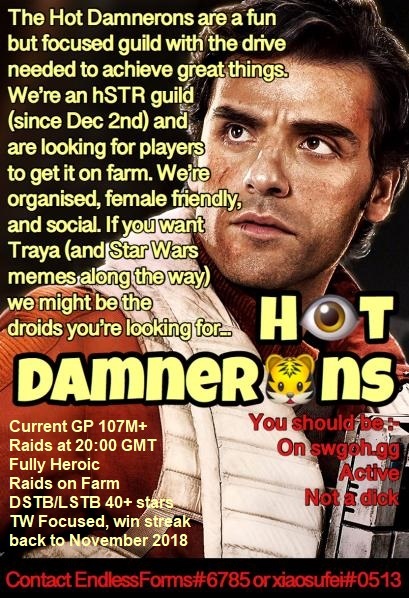 We do have some TB, TW and general guild rules but are very relaxed overall and want members that communicate (ideally use Discord) and are friendly and tolerant. Sith Raid run on separate day. 24 hour period the FFA when raid starts. Looking for at least 3.5 GP. Will consider lower GP. Ideal if you have Revan, but not required. We are laid back and have good fun. Please send ally code to get started. Channel 4 News Team is looking for a couple new members. We're mostly based on EST and the guild is open to join. Us: 100+mm GP, getting very close to running HSTR. Getting 30+ stars in both TBs and getting better all the time. You: Be active and friendly. We're here to have fun after all. Starborn is currently looking for ten individuals 2.5m GP or higher to join us, HSTR ready squads required. We would also consider a merger with a lower GP guild forming a developmental guild. Our guild is like a family, we use LINE, run all Heroic raids with HSTR being run every five days. Waffle Mutiny is looking for some Star Wars loving folk to help us grow! We take care of our younglings and everyone gets along really well. Discord chat is very lively and entertaining. Raids: Heroic Pit and Tank 2-3 times a week, Sith Raid Heroic 2 times a week on farm. 24 hour zero damage on Pit and no one with 7* Han does damage so that all the younglings can get Raid Han quickly! Events: 40 star DSTB last time around and 36 LSTB, ROLO and Probe shards, TW we rarely get beaten and last 4 rounds didn't lose a territory. Prepping and coordinating TW is our favorite thing to do as a guild! Requirements: 1 mil GP, Discord, TW, TB and HSTR participation, 600 daily tickets, must be active within 48 hours unless notification given.., we always understand if there are things more important than the game. Most important: not an ****, not judgmental, here to have fun and help the guild grow! We've built up a great team and have a one spot open. 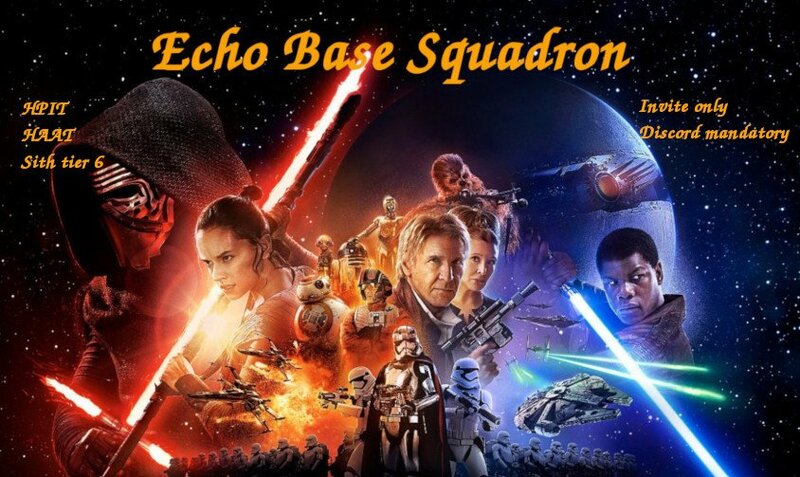 We'd love to welcome someone to join our Star Wars family and grow with us, bonus points if you're into pop culture references because we drop a WHOLE lot. First Order Mavens are looking for active players to join our guild. We have recently had 4 spots open up - if you are interested please ping me via in app message (ally code 315-448-641) or send me a message on here. We are a guild an international guild with players from all over the world. 93M GP. We are not part of an alliance - you won't be told where to go or placed into a training guild. First in, best dressed. HPIT and HAAT launch on a rotating basis at 2:00P, 8:00P, 2:00A, 8:00A UTC with 24hr signup period. STR autolaunches at character reset time. We are a handful of JTR teams away from making the jump to HSTR farm. Level 80 minimum (flexible). No GP requirement. Target 400 tickets per day. Our last TBs hauls were 27 stars. In TW, we have a 90k minimum rule for squads on the front line. If you can't contribute to that, we will ask you to deploy specific teams in subsequent lines, or save your toons for offense. First and foremost, have fun. We have some really long term players (~4M GP) who are all about punching above our weight and beating up on whales! We are PTA SWH an European guild and we're around 108 M GP. We belong to a community (not alliance) of more than 400 players. Here you will always have feedback about the game and other things in life in general. • Raids are launched on a rotation of 3 different times (4/12/20 UTC) to accommodate every member's personal schedules with a 24-hour join period for HPIT & HAAT, then FFA. • Have fun! It's a **** game! We are a friendly but active UK based. Currently we have 49 players and 102mil GP. We are looking to fill our roster and some replacements with active teamplayers. We are a highly organized, independent, US based HSTR guild. Currently we’re 57-3 in TW and average 43* in LSTB and 46* in DSTB. We do HRancor 3x a week (7pm CST), HAAT 2x a week (8pm CST), and HSTR 2x a week (launching 9pm CST). We have a wide range of players, including several veterans, and a low guild turnover rate. Fly Casual is 110 million gp recruiting level 85 players to help us as we ramp into heroic sith raiding. JTR and nightsister squads a plus. We are a casual PST guild consisting mainly of F2P players many of whom have been together since guilds launched with plenty of leeway given for vacations and real life. Even though we are casual we are 52-7 in Territory battles, get 30 plus stars on both Territory Battles and have both Pit and Tank on farm. If you are interested in joining please send a friend request to : remorhaz 234-893-849 and I’ll invite you. If you have any question please feel free to PM and I’ll get back to you ASAP. Semi active, no hard tix requirement, great group to gear up with. Booting only for inactivity. Recruiting individuals or small group up to 5 persons. 2M GP preferred, but daily player welcome. TW 50+ wins, double zetas. TB 30++ stars. Need few more RJT/Jedi/NS teams for final HSTR push. Last one ended with 5% of P2 left. Message us on our Discord recruitment server. MTFBWY! We are a friendly but active UK based guild. Currently we have 49 players and 103mil GP and looking for daily and active teamplayers. 2.4 mil average gp. 44 members with 104+ mil gp. Bonjour guilde française cherchant joueurs motivés. Rancor héroique et HAAT sans problème. Minimum de participation en GT et BT. Mon code allié est 838-694-154, je suis sur swgoh si vous voulez checker mon profil ou ma guilde. N'hésitez pas à me contacter pour discuter et postuler. Looking for 5-8 HSTR ready group of folks to join our HSTR farming guild - Legion Ascendant. We've had HSTR on farm for 4 months, but are looking to replace a group of RL friends that dropped from the game together. Looking forward to discussing! You can find us on discord at https://discord.gg/hKdDCc6 or here on the forums. Ask for Andoligan or Meshliv. See you around the holotable! Hello holotable heroes! 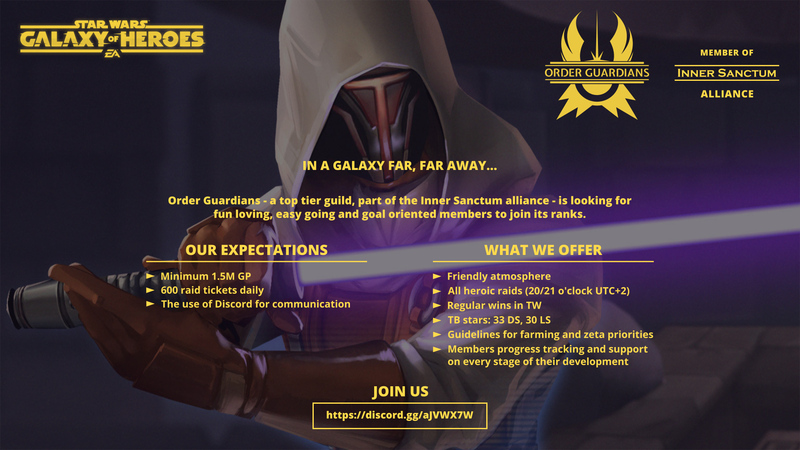 Order Guardians - a top tier guild, member of the Inner Sanctum Alliance, is looking for fun-loving and easy-going but also goal oriented players to join its ranks. There are currently 2 vacant positions. Our guild's GP is 109m at the moment and we are quickly progressing. The guild's official time zone is UTC+2(or GMT+2 in other words), but we have international members in different time zones. Tired of being the bad guy trying to drag the rest of your guild to success? Do you hate losing TW or missing TB stars because no one cares? If the answer is YES, Then it’s time to join SHAL. We are 190 Million TW focused guild filled with high participation members..
All heroic raids starting time: ~02:00PM UTC (09AM EDT), ~24h for joining. + Gain over 1.8m GP (can be less if u gain top rank in arena/fleet). DM me if u are interested. Rogue1 - 152MM GP guild looking for a motivated 2-3 million GP player! Guild payout at 8:30pm EST / 12:30am UTC. Tired of being in a guild with strict rules? Tired of being the only one who does anything in your guild? Tired of not getting all those cool, shiny prizes from TW or TB? Give Rogue1 a look! We're a guild made of members who want to enjoy playing this game while not breaking our backs trying to get the most out of it. We have people soloing the Rancor in minutes. We get those sweet, sweet GK shards in about 2 hours. We've been farming hSTR so those Traya shards are rolling in. We have 50 wins in TW. We're farming ROLO and IPD in TB. What more could you want? Maybe you're on the fence. How about some guild rules? Beyond Omega is a European guild, we are in the Central European Time zone. We are looking for 2-5 active players to help us speed up the Heroic sith raid. - Active participation in TB, and at least passive participation in TW. - Prefer if you use swgoh.gg and discord, although we also have a facebook group if you want that. If you prefer to only chat in game, that is fine but only if you know very clearly what you are doing. - We aim high, but we don't exhaust our players. I only request maximum effort when it makes a difference. - Personalized assistance with farming and mods if you wish. 2.4 mil average gp. 47 members with 110+ mil gp.